Bluebonnets Texas Official State Flower. Hanging on the second floor of the 1855-vintage Neill-Cochran House in Austin is an oil painting credited with doing what even high-priced lobbyists can't always accomplish - swaying the Texas Legislature. The significance of the piece of art goes back to the turn of the last century, when Texas lawmakers departed from their usual weighty deliberations to ponder what native plant should be designated the official state flower. Rep. John Nance Garner of Uvalde thought the prickly pear cactus deserved the honor. As tough as Texas, the thorny plant produced a flower the future Vice President considered as beautiful as any orchid. Cactus Jack's notion of having a cactus as the state flower earned him a colorful nickname, but no cigar. The idea definitely got under Rep. Phillip H. Clements' skin. To the Goldthwaite legislator's mind, nothing would do but to name the cotton boll -- he called it the "white rose of commerce" - as the official state flower. But with all due respect, the ladies of the Colonial Dames took Garner and Clements both for blooming fools, as least when it came to Texas flora. The Dames argued that any real Texan realized that only one flower truly represented the beauty of the Lone Star State, Lupine subcarnosus. To underscore their opinion, members of the Austin chapter rode in their buggies to the Capitol and displayed for the members of the House an oil painting by a local woman, Mode H. Walker. 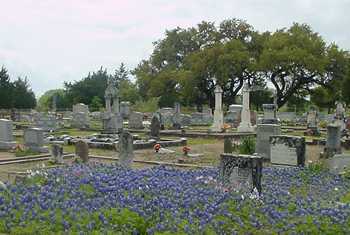 The piece features a reddish-brown pitcher full of bluebonnets and primroses. The blue and pink brush strokes still catch the eye, an artful rendering in a genre often cluttered with amateurish work. Walker's painting clearly got the attention of the House. Oh, and the sweet-smelling bouquets of bluebonnets the Dames placed on each lawmaker's desk also helped make their case. Rep. John Green of DeWitt County carried the bill making the bluebonnet the Texas state flower and it passed. Gov. Joseph D. Sayers signed the measure into law on March 7, 1901. So who was this artist whose work influenced the Legislature as effectively as a high-powered lobbyist armed with campaign contributions, a hospitality suite and 50 yard line University of Texas football tickets? "Once a while back," says Neill-Cochran House Museum administrator Cecille Marcato, "I poked around looking for information on Mode Walker and couldn't fine anything." Indeed, a google.com search turned up no more on Miss Walker than the fact that she had done the opinion-swaying bluebonnet painting. While Walker's painting has been credited with convincing the Legislature that bluebonnets deserved official status, Marcato says there's another oil painting connected to the issue. It's a bluebonnet landscape by Julian Onderdonk once owned by Mrs. Sawnie Robertson, one of the Dames who took part in the campaign to gain recognition for the wildflower. In commemoration of Mrs. Robertson's role in achieving official standing for the bluebonnet, her granddaughter presented the painting to the Governor's Mansion in 1980. 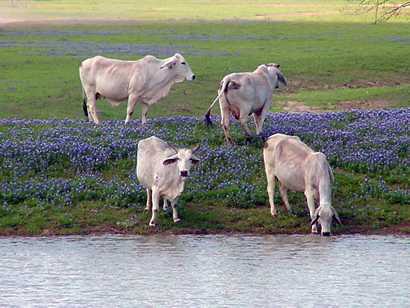 Even though the Dames succeeded in transforming the bluebonnet into an official Texas icon, the 1901 law had a loophole big enough to walk a cow through: The statute specified Lupinus subcarnosus as the state flower even though Texas has other varieties of Lupinus. Not until March 8, 1971 did the Legislature return to the bluebonnet issue, finally amending the law to add Lupinus texensis and "any other variety of bluebonnet not heretofore recorded."